Peter Diamond, head of Bath’s CID, takes a city break in Vienna, where his favourite film, The Third Man, was set, but everything goes wrong and his companion Paloma calls a halt to their relationship. Meanwhile, strange things are happening to jobbing musician Mel Farran, who finds himself scouted by methods closer to the spy world than the concert platform. The chance of joining a once-famous string quartet in a residency at Bath Spa University is too tempting for Mel to refuse. Then a body is found in the city canal, and the only clue to the dead woman’s identity is the tattoo of a music note on one of her teeth. For Diamond, who wouldn’t know a Stradivarius from a French horn, the investigation is his most demanding ever. Three mysterious deaths need to be probed while his own personal life is in free fall. 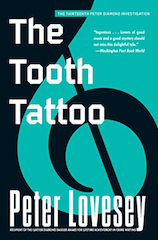 You can also read the full Washington Post review of The Tooth Tattoo. 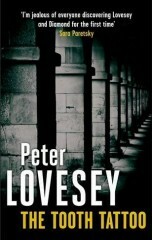 “For want of a better term, Peter Lovesey’s novels about Peter Diamond, the chief of detectves in the historic English city of Bath, are designated as police procedurals. But these erudite and wondrously witty books are unlike any police procedural you’ve ever read. THE TOOTH TATTOO is a case in point. Of course there’s a murder to be solved – a curious one, involving a young Japanese music lover who has come to Bath in hopes of hearing a celebrated string quartet known as the Staccati. But for the most part, the murder investigation provides the structural framework for a group portrait of the eccentric members of this captivating ensemble and the music they play with such rapturous devotion. “I must resist saying Peter Lovesey is at the peak of his game since, judging by past experience, he will soon produce another book that is even better than THE TOOTH TATTOO. Let it suffice to say that this is one of his best. You can see this video on the Livestream website as well.